Eric grew up in Bucks County Pennsylvania. He was the top small bore shooter on Central Buck HS Shooting team and shot three position indoor rifle and field archer at the Bucks Co Fish and Game Club. Eric earned his Eagle badge and was a member of the Order of the Arrow with the Boy Scouts of America. In 1970 he graduated from the University of Maine, Orion with a BS in Wildlife Management. He was an officer in Alpha Gamma Rho fraternity. He worked summers in wildlife with the US Forest Service and Maine Dept of Inland Fisheries and Game. In 1971 Eric started with the Vermont Department of Fish and Game as a Game Warden. In his 32 year career he served as a police trainer, hunter education coordinator and on the core management team. Honors included: NRA National champion for conservation officer police revolver, State champion police revolver, and Warden hunter education instructor of the year. During this time he earned his associate degree in Criminal Justice, became a certified public manager and graduated from the VT Agency of Natural Resources Leadership and Management program. After retiring Eric moved to Wellington, CO to take the Executive Vice President position with the International Hunter Education Association. Accomplishments included developing the organizations first strategic plan, facilitating the switch to the Carver form of board governance, improved funding, developing and implementing on line Hunter Education courses and strengthened international ties. Eric represented IHEA on committees and task forces with the Association of Wildlife Agencies, USFWS, American Wildlife Conservation Partners, National Bowhunter's Educational Foundation and the National Wild Turkey Federation. 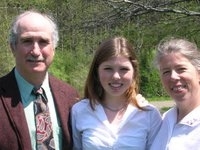 In 2006, Eric moved back to Vermont and set up his consultancy, Eric C. Nuse and Associates. He has served on numerous VT Fish and Wildlife Department and Agency of Natural Resources committees and working groups as a sportsmen representative. Eric was invited to join the Board of Orion-the Hunter's Institute in Helena, MT. In 2010 he was promoted to Executive Director taking over for founder Jim Posewitz and currently serves on the board of Directors. Currently Eric is on the board for the Backcountry Hunter's and Anglers New England chapter, the Johnson Conservation Commission and Friends of Green River Reservoir. Eric is married with 5 children, 10 hens, and 2 cats. He is an avid hunter, fisher, hiker, wildlife watcher, tracker, skier, wilderness canoeist and reader. Memberships include: Life member National Rife Association, Izaak Walton League of America, Orion-the Hunter's Institute, life member International Hunter Education Association, Vermont Hunter Education Association, Lamoille Valley Fish and Game Club, Theodore Roosevelt Conservation Partners, the Vermont Wildlife Partnership and, the Vermont Warden's Association.